Today I am very pleased to bring you a review of a lovely book by Kirsti Johanson entitled Tahoe Knits. I was first introduced to Kirsti and her work while working on Jane Austen Knits and I have always found her pieces both beautiful and inspiring. 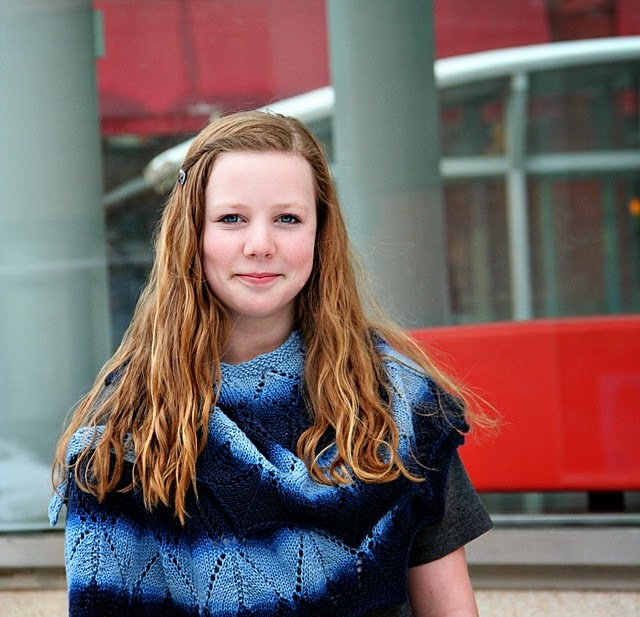 Her newest project, a self-published knitting book inspired by nature and hiking, is a unique collaboration with a few of her very talented students. High school junior Jemima Liposcak created some lovely pen & ink illustrations which pepper the pages, high school senior Claire Wisniewski composed a poem for each chapter, and college student Britt Stevens wrote an essay for each chapter as well. Kirsti's students also modeled for the book, making it a true creative collective. This beautiful collection of knitted accessories is accompanied by thoughtful essays, poems, and even a recipe for Cherry Almond Scones- they look delicious! Knitting instructions are both written and charted, and the photographs are beautiful. 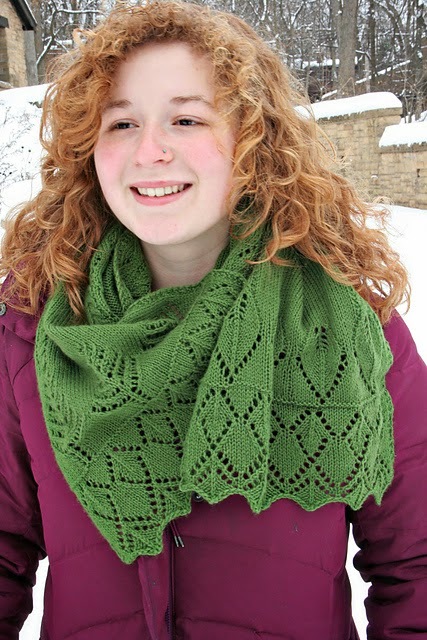 You can see all of the patterns from Tahoe Knits here on Ravelry. The best part? Kirsti is graciously offering to gift one print copy and two digital copies of her new book to three of you lucky knitters. Comments are now closed for this drawing. Congratulations to Gobzone, TerryLee, and MarianHooks for winning! Thanks! My favorite place to go hiking is my own backyard - having 180 acres means lots of places to walk and we get to watch the otters on the pond, hope like heck we don't run into momma bear and her cubs, lots of rabbits, partridge, deer & moose too. Any State Park in Toledo, Ohio. We've lived in many cities throughout the US and I have never seen the hiking opportunities that Toledo provides its residents...within everyone's reach! It would be difficult for me to chose one trail over another. They all provide vast beauty and difficulty levels for anyone to participate. I've been waiting a very long time to hail these hiking paths! Thank you for this opportunity. Our favorite hiking trail; is in the Bruce Peninsula, in Ontario, nearest to Walter's Falls, there are about 5 falls within 30 minutes drive of each other; each with fabulous hiking trails. I live in NH so there are so many great places to hike. Mt. Monadnock is in my backyard, so that is the place that I frequent. The views from NH peaks are unbelievable. Thanks for the GREAT give away!! My favorite hiking trail is not any one I have hiked before. My favorite hiking trail is the next one I will hike! Having just moved with our kids to a new state, my husband and I have found hiking to be a balm on the stress of moving and we can't wait to go again. My favorite hikes are at Black Farm nature preserve in Hopkinton, RI. The trails take you past the remnants of an old farm, a family graveyard, past a kettle pond and over a mill-race brook. Ravelry name: Lola--and thanks! Favorite hiking place? Laurel Mountains in Pennsylvania - that's where I started my love of hiking & camping in the woods, & have hopefully passed it on to my children. thanks for the chance to win your book of beautiful patterns! I do not hike as I am now confined to a wheelchair. I grew up in Kansas. When I got my drivers license I used to go out into the rural areas around Wichita where I would look for dirt roads. I would pull to the side of the road and start walking. I especially liked to walk along or into wheat fields. Another favorite was sunflower fields. You don't walk into them, they are too easily harmed, plus it would have been very scratchy. I now live in the middle of the Dallas/Ft. Worth area, or the Mid-Cities. This is a completely urban area. My husband and I have very limited means and whatever vacation time my husband gets is spent at our home. We do love to watch documentaries and that is how we "hike". Plus hiking this way allows me to knit at the same time. Thank you for the chance. I really enjoyed hiking up Multnomah Falls in Oregon when we visited there a few years ago. A real challenge! Rav ID is jenniesanto. Thanks for the giveaway! Memories take me back to the Appalachian Trail along route 40 between Hagerstown and Frederick MD. On Sunday afternoons, we would trek either north or south on the trail. Thank you for the opportunity to possibly own this creative book. My favorite place to hike is the old family homestead where I grew up in northern Minnesota. Having moved back there six months ago I'm looking forward to many walks in God's country. My favorite place to hike is the old family homestead in northern Minnesota. Having just moved back there six months ago I am looking forward to many long walks in God's country. Kearsarge Mountain in NH! So worth the hike! The Yorkshire Moors is my favourite place to hike! I try to hike daily at a farm up the road from our house. I can't wait til berry season arrives so I can munch while I hike! Thanks for the chance to win this book! What better two things to put together, knitting and hiking. Lovely chance to win - thank you! My favourite hiking place is Dartmoor in the County of Devon (UK) and our house looks out over Pew Tor & Cox Tor (high Granite outcrops). The colours across the moors are different everyday, we are so lucky to live here. Very wet so plenty of time for knitting I would love the chance to have go at some of the patterns in the book. Thanks. It looks like a lovely book! My favorite hike is almost out my back door - Water Canyon. You can get to it from several different trailheads, but it winds thru a canyon with sandstone walls on each side and then opens into a beautiful meadow with massive ponderosa pines. We recently hiked up Mt. Galbraith in Golden, Colorado with our 4-year-old grandson. It was somewhat challenging for him but doable. He proclaimed himself, "Hike Master!" Kirsti's new book looks fabulous! Since I live on the side of the Tehachapi mountains in California, I love to hike all our dirt roads up here. Thanks for such a wonderful giveaway. I used to love hiking in Franconia Notch back in my home state of NH. I'm looking forward to discovering amazing new hikes in our new state of WI, being on the shores of Lake Michigan is simply amazing. not sure if this is really a hike by most standard .... from cruz bay to salomon bay in st john usvi..... its a fire road to a path to glorious beach. We love hiking along the Appalachian Trail, especially at the Lemon Squeeze. There are all sorts of hiking/biking trails here in Ajax. My favourites are all down by the lake. It is very calm and peaceful, even when there are a bunch of people hiking around you. I love to hike in the prairie at the UW Arboretum, Madison WI. My ravelry name is itsknits. My favorite trail is the mile we walk to get to my dad' cabin. He built it on the Niobrara River in Nebraska. My girls love to walk the trail through the canyons and across the creek! Love the concept behind this book and reading these comments. Brings back memories because there are so many wonderful hikes to do and remember. Right now, given the long winter we've had, I'd say my favorite hike was the Na Pali coastline. A tropical paradise seems mighty fine right now. I love hiking in Rocky Mountain National Park early in the morning and then head back to Estes Park, Colorado, for lunch. Of course, I top the day off with a yarn shop visit to the Stitchin Den! Above comment is from MarianHooks on Ravelry.